The Micro Engineering structure with an added roof over the walk. Finally, I've constructed a building that will NOT be located in Oakdale. 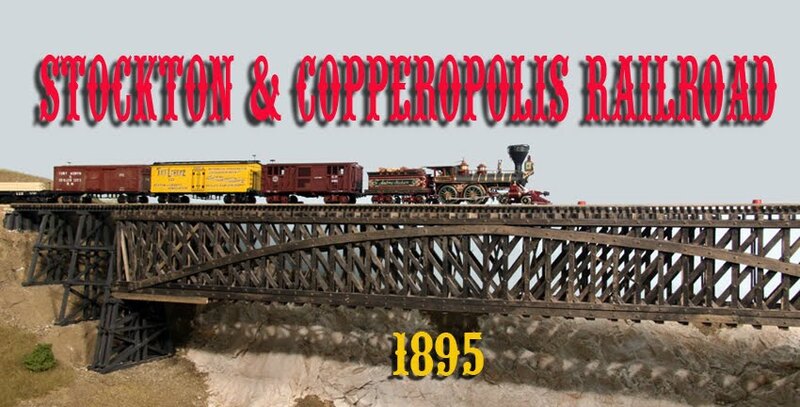 Several years ago, I had bought some model railroad stuff which include a couple of old Micro Engineering structures someone had built up directly from the kit. They were dirty but had satisfactory construction and somewhat typical of the Central California area I am modeling. As a filler in my construction plans, I decided to paint and letter the building. 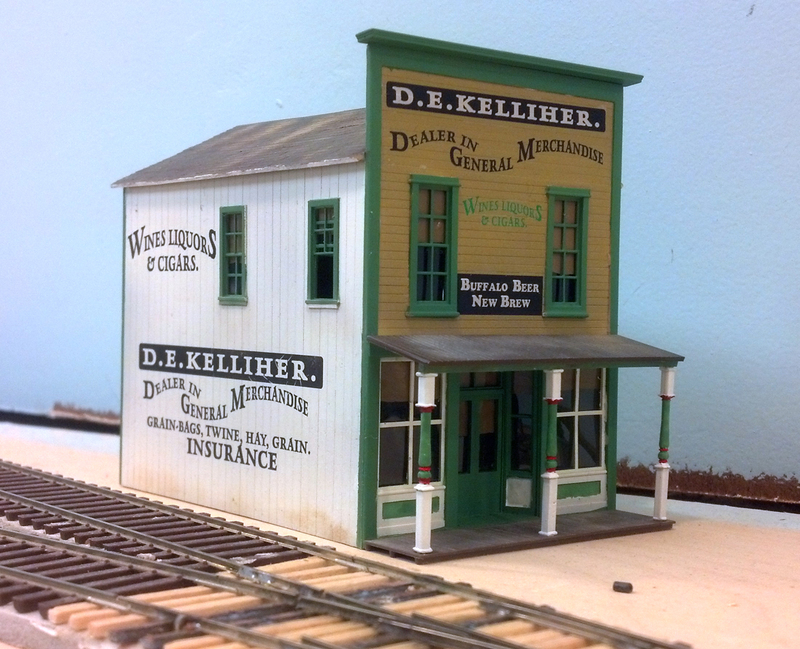 The prototype I chose to loosely model was an old store near the junction of the Milton Road and the Sonora Road. It was abandoned when I photographed it a few years ago but the signs attracted me and the little plastic building seemed right for the signs. the 1910s at this location. Since the store was on private property, I could not see the false front on what was once the main road so I improvised. The porch roof was added since most California buildings had them to deflect the intense sun received in the summers and was supported by columns from Alexander. I decided that Mr. Kelliher would have sold Buffalo Beer which was made by a Sacramento Brewery. This brand was an common as Boca Beer which signs have been seen in other postings. I am not sure just where the building will end up. Like the prototype, it represents a rural local store which would be out of town. Right now I am think either Cometa or Burnett's. We shall see as scenery develops in those locations. Wagons Galore with Harnesses, Too! Three companies unloading goods at the Oakdale team track. The typical two-horse teams gave the public track its name. 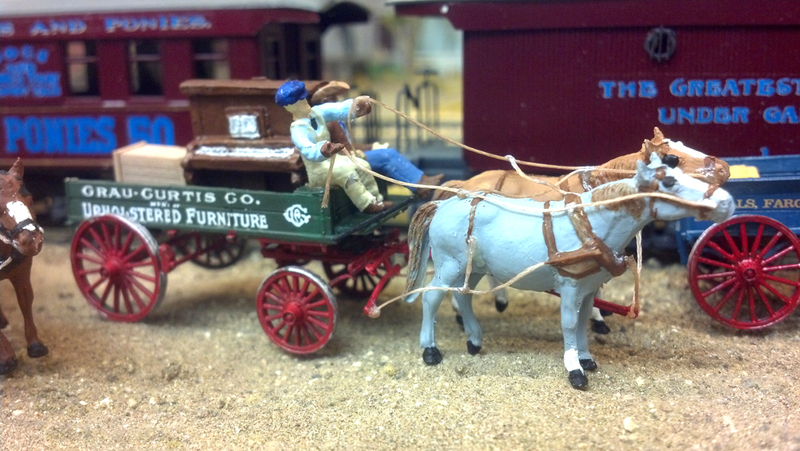 All three wagons are variations of the Jordan Farm Wagon kit. The wagon building project is done. 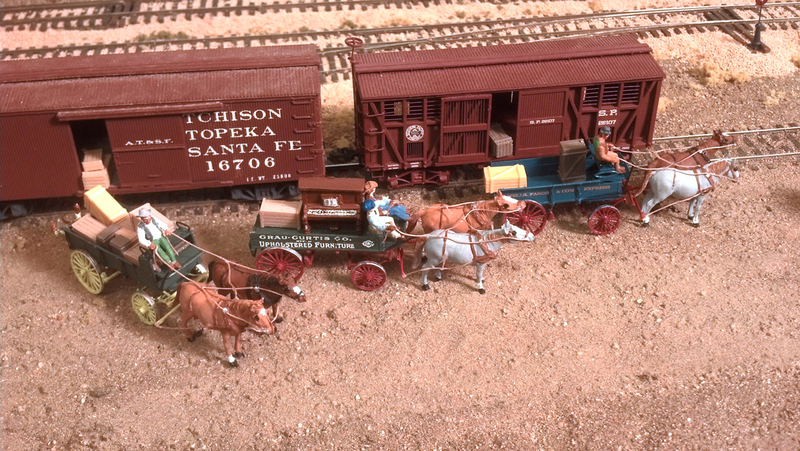 As mentioned in the last blog (Wagon Assembly Line), Jordan kits were used as a basis for them all. The lettering on the wagons was all decals made by Art Griffin. If you are not familiar with his line, you should check it out at http://www.greatdecals.com/Griffin.htm. 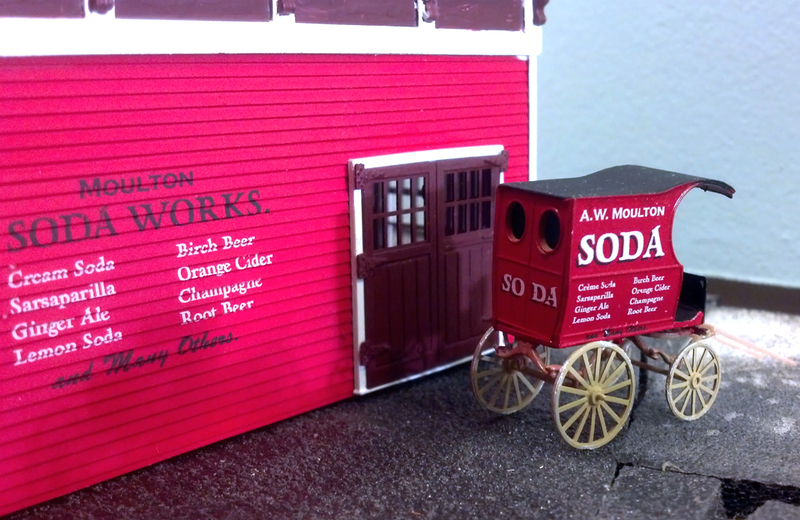 The only exceptions were the Wells-Fargo wagon and the Moulton Soda wagon, both of which were made from my artwork. If you look closely at the Wells-Fargo decals, you can see that it says Wells, Fargo & Co's Express. 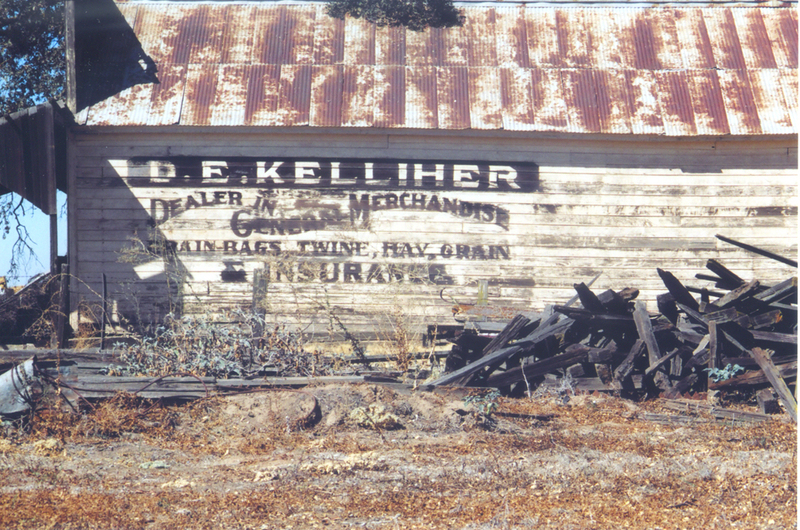 Prior to 1898, this was the name used by the firm. After 1898, they left off the apostrophe-ess on both the spelled-out name and on the diamond-shaped sign that was used. in a Blue Springs MO restaurant. The Jordan horses all have the harnesses cast on the horse so all the modeler has to do is paint the harness to make a good-looking horse. Heretofore, I have left off the traces and reins mostly due to a lack of a good scale-sized material with which to make them. A friend of mine, Keith Robinson, suggested a carbon-fiber based fishing line which was very small. I checked it out and, while I did not buy the exact line Keith suggested, I did find one that seemed to work and it was a light tan color which was close enough to harness color to suit me. The big problem now was to find out what harnesses looked like, where they attached and so on. A couple of pieces of new furniture bound for the local "social" club. 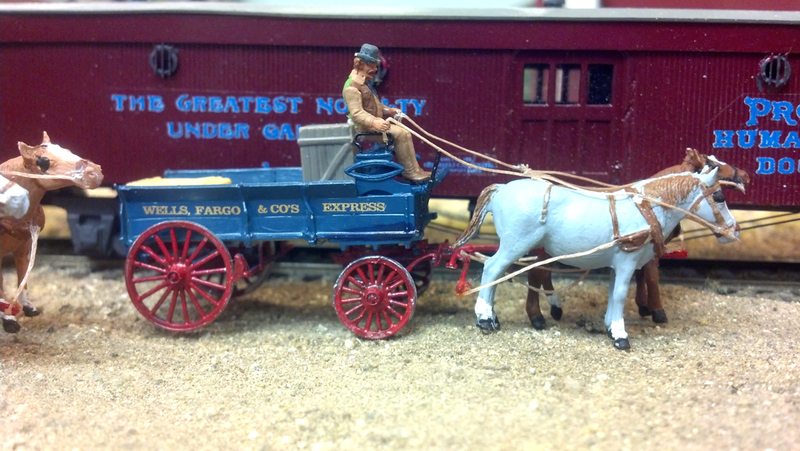 The colors and lettering styles for the Wells-Fargo wagon were taken from a period color drawing advertising the wagons. 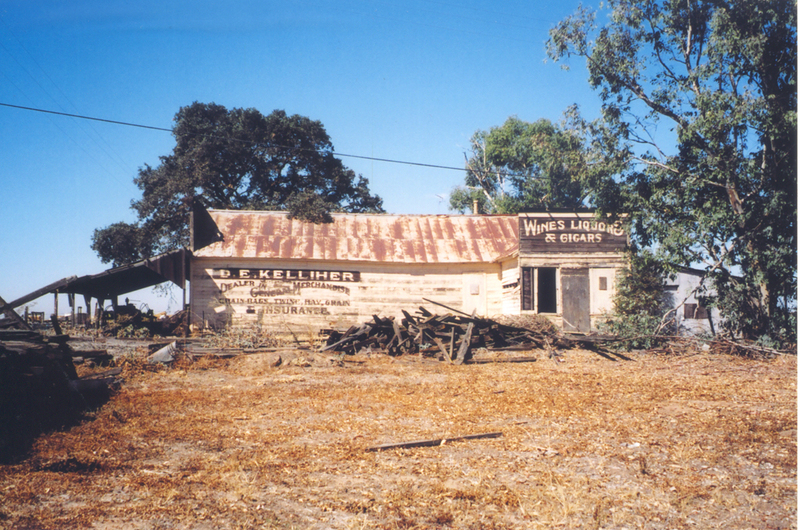 The Jordan Light Delivery Wagon was the basis for this grocer's delivery. I found out that knowledge about harnessing horses is not quite as common as it once was. You can find catalogs of current suppliers of the necessary appliances but they don't publish instructions on their websites. To make matters a bit worse, I found out that, for every application, there were several different rigs. To make a long story short, I found out what I needed to know and applied it to my project wagons. This is a first trial and I am still learning the best way to work with this material but it seems to be promising. While his horse tries to find a little nutrition, a drayer waits his turn at the team track. Delivering soda is a big business so the Soda Works keeps a small wagon and a single horse. While the wagon sits outside, the horse gets an inside stall. When I build items where I need more than one, I find it a bit more convenient to build more than one in an assembly line fashion. 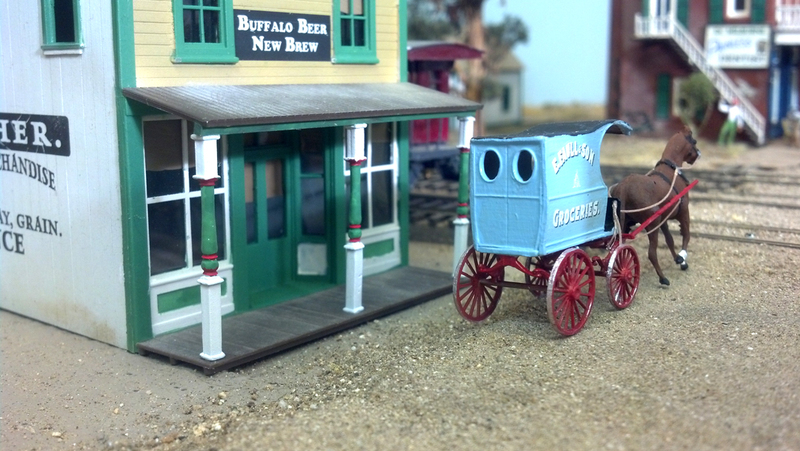 When you model the nineteenth century, you need a lot of wagons to make the scene look right. 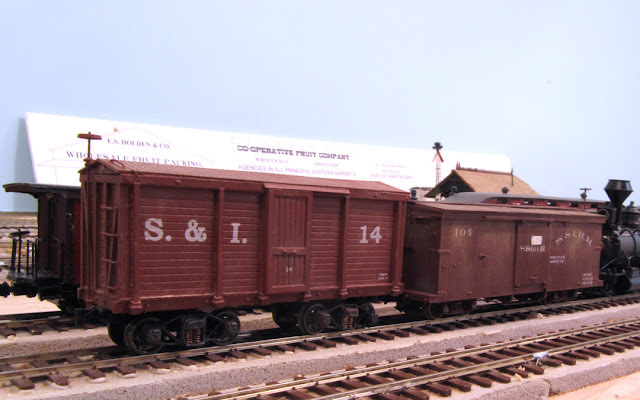 Think how many wagon loads are there in a boxcar? I decided to build a few of the Jordan kits I had been accumulating but I wanted some variation so they would look like they came from different manufacturers. I chose the Farm Wagon as my basic kit, built one as Jordan intended, another with lower sides, another with a spring seat, one flatbed wagon and a last one with very low sides. These went all right. The Jordan kits are finely detailed and look right if you don't lose too many of the very tiny parts. 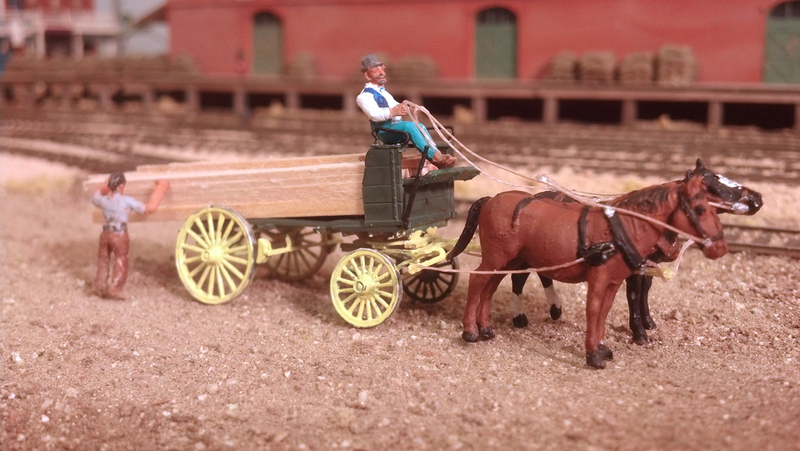 Most wagons had two colors, one for the wagon bed and another for the wheels and running gear. This now takes a little more planning since the right running gear has to go with the right wagon. You also find that very small parts are often blown away by even the light pressure of an airbrush so you need to make sure that they are very secure. I used painters' tape which worked fairly well. 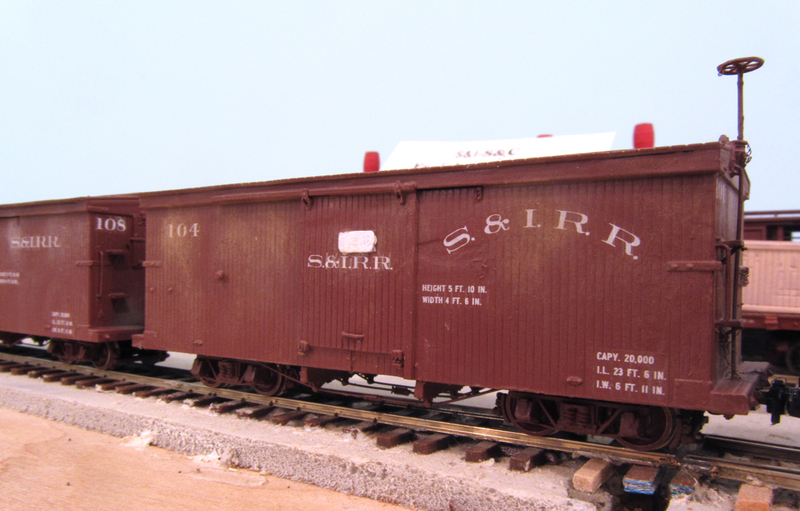 The last three wagons were also Jordan products, the light and standard Delivery Wagons. These were assembled per the directions. I used some of Art Griffin's wagon decals (www.greatdecals.com/Griffin.htm) so the colors had to match them. 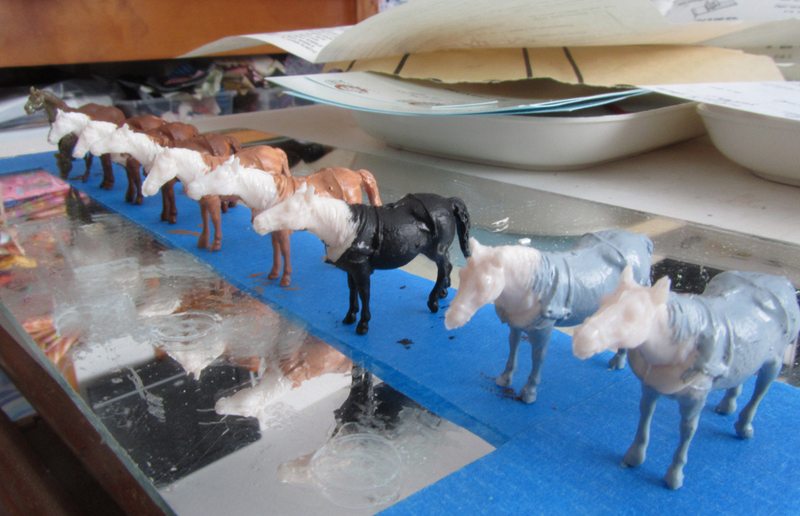 When the body paint is dry, the heads, harnesses and hooves will be painted. The tape is really not holding them upright. They are just standing there on their own. No, the end horses are not blue, they're really gray. Painting horses is another interesting chore. Horses are hard to hold while painting. There is not enough hoof surface to hold well on tape. I decided to hold their heads and paint the rest. I'll go back and get the heads after the body dries. Then I have to paint the hooves, add stockings and other small marks to make them more individual and then paint the cast-on harness which is painstaking. I use a water-based paint, a fine brush and a wet Q-tip to wipe off any paint that shouldn't be there. 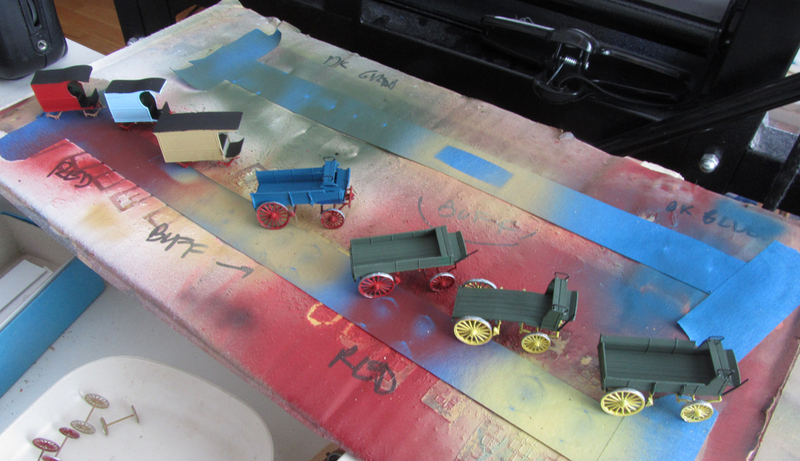 Painting figures to drive the wagons come next and that's a little easier. New boxcars for the Stockton & Ione are patterned after 1880s Denver & Rio Grande prototypes. The red barrels are on a building behind the cars. The HOn3 Rail Line boxcar kit has been around for a while and it is a good representation of a 30-foot later period D&RGW car. I wanted to try to see if I could easily modify it to represent an early 25-foot car of 10-ton capacity. To do this, I cut the car at the door opening and glued the two halves together with some reinforcing strips inside. This gave me the necessary length. Using a fine razor saw, I removed the roof running boards. Some .020 thick styrene with .060 scribing applied right over the Murphy roof gave me the earlier wood plank roof. A .010 x .080 strip was applied for a new fascia and cut flush with the car ends. New doors were made from .020 scribed styrene and the door hardware from the kit used to "hang" it. The lettering was varied slightly with the arth to a give a little variety to the cars. 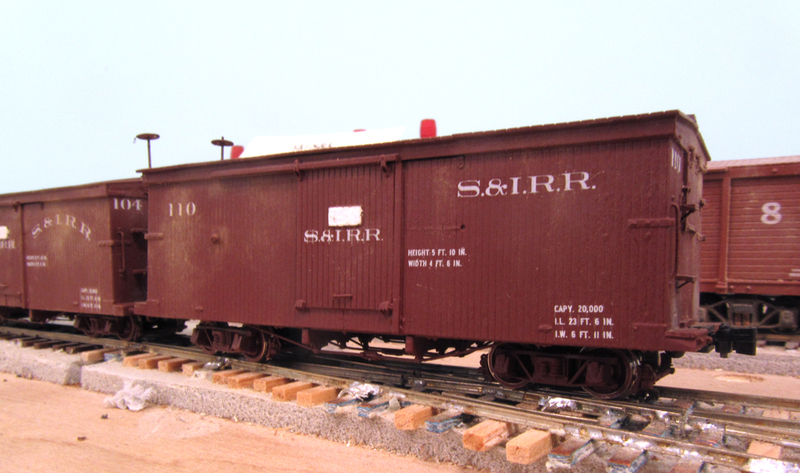 The earlier boxcars had short end platforms for the carmen to stand upon. I glued .060 x .124 strips with scribed siding to represent those. The nut-bolt-washer representations for the grab iron bolts were removed with a razor blade except for two on the end for the new grab irons. The floor was similarly shortened and reglued. Fishing line truss rods and Grandt turnbuckles were used. The brake cylinder was only applied to one car as I figured this little narrow gauge line would be slow in putting brakes on everything. Compared to the 1875 S&I prototype cars, the D&RG freelanced cars are much more graceful. The cars were painted boxcar red and decals based on D&RG lettering schemes were applied. The finished car is not an exact model of the prototype but close enough for the Stockton & Ione.